Mount Sinabung in Karo regency, North Sumatra, erupted again last night in what has been called the most powerful blast since September, which created a volcanic-ash cloud that was 10-kilometers high. This most recent eruption, since new activity began three weeks ago, occurred at 9:56 p.m. local time. Mt. 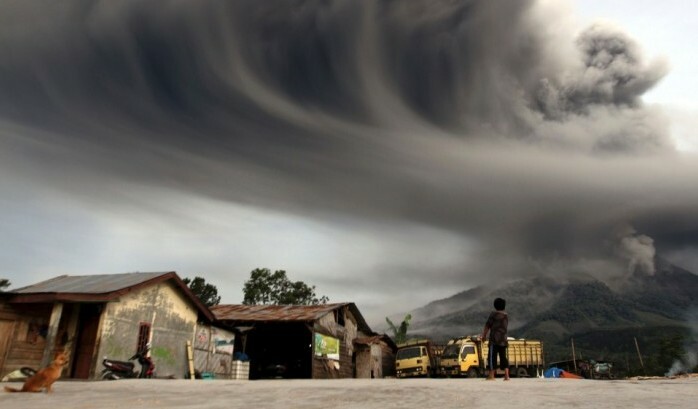 Sinabung observation team reported that three small eruptions had occurred since Tuesday’s major blast. The first eruption occurred at 2:40 a.m. local time on Wednesday, the second less than two hours later at 4:05 a.m., and the third at 6:19 a.m.